Fr. Aengus Donlon was Parish Priest at Holy Family from 1986 till 2004. Fr. Donlon is one of four brothers, Aiden, Brendan, Kevin, together with Fr Aegus G Donlon, all are priests. 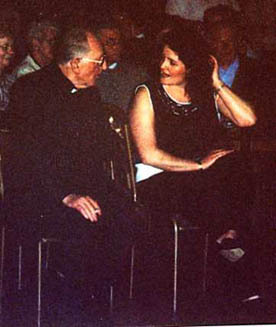 In 1992 they all came to Holy family for a Family re-union and concelebrated Mass together. Fr Donlon with his housekeeper Fiona at their retirement presentation. Fr Aengus Gabriel Donlon, priest of the Archdiocese died on Wednesday 4th November 2015 in hospital in Coventry. His body was received into Holy Family Church, on Tuesday 24th November 2015 at 7.00pm and followed by Mass. The Funeral Mass was celebrated at Holy Family Church on Wednesday 25th November 2015 at 12 noon. This was followed by burial at Wilnecote New Cemetery, Wilnecote Lane, Tamworth B77 2NE. Photos from Funeral Mass at Holy Family link.